What a way to end Father's Day this year: being a witness to a hold-up. But that is getting ahead of my story. We went to Laguna yesterday to visit my father-in-law and left early today to go back home. My wife cooked rice, scrambled eggs and longganisa for our breakfast. I also bought some pan de sal from the neighborhood bakery. After breakfast, we passed by my wife's uncle before leaving to greet him. We were invited to join his family and have lunch at Max's Restaurant in Sta. Cruz. We were supposed to pick up my wife's cousin but she declined. 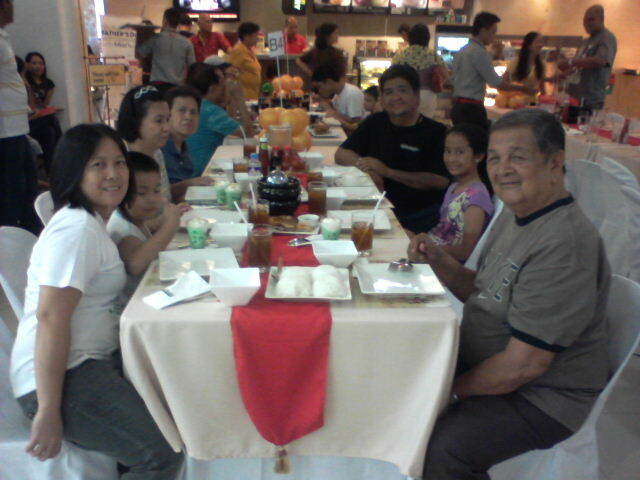 We followed my wife's uncle and his family to the Sunstar Mall where they had already ordered the food. It was a feast. We had their famous fried chicken, sinigang na hipon, crispy liempo, kare-kare and pansit with buko pandan for dessert. After lunch, we thanked them for sharing their food and excused ourselves as we went on our way back to Manila. It took us about an hour and a half to get to Sucat where we went to Shopwise to do our weekly grocery. 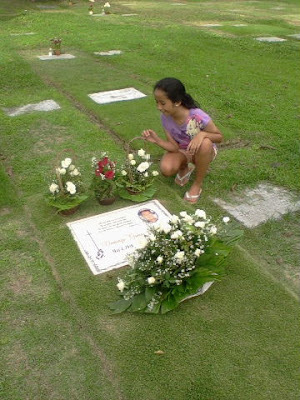 After that, we visited my father at the Manila Memorial Park where my daughter brought a bouquet of flower. We were supposed to have dinner at Papa John's in BF Sucat. However, since it was still early, we decided to go home first to rest and have dinner at the local Pizza Hut later when we got hungry. At around 8:30 PM, we decided to go to a nearby Pizza Hut to eat. We ordered their Hot Meal, which consisted of one Super Family Supremo Tuscani Pizza, 2 orders of Spaghetting Bolognese and a 1.5 liter Pepsi. It's supposed to be for delivery only so we had it delivered to their store so we can have it eaten there, ha ha ha. The cashier told us that their credit card machine is with one of the delivery boys and if we are willing to wait. After saying yes, they already prepared our order even without our credit card being verified yet. The spaghetti bolognese were the first to arrive and since we were already hungry, the two orders were quickly devoured. It was a a little bit salty for my taste but was just fine for my two girls. There were a lot of orders for delivery that our pizza came a little later than we expected. The food server came to see us once in a while to give us an update on how long it will still take for the pizza to arrive, "Sir, 4 minutes na lang po....., Sir, 2 minutes na lang po... Sir, heto na po. Thank you po." While we were having dinner, a man came in to order the 2 family pizza for P419, while a little later on a family of 4 came in to order also. We noticed that the rain outside was strong and was thankful because our muddied car would be washed with rainwater, he he he. Then when the man who earlier ordered was stepping out to wait in his vehicle, a man with a bonnet and helmet on and a pistol in his hand suddenly burst inside the store pushing aside the former and the family of four, then proceeded to the counter, kicking the manager on the stomach and ordered the cashier to help him scoop out the money from the cash register. We later learned that the register contained only about P5000 while the rest of the sales for the last 2 days had already been in the safe. All the clients moved to the corner where we were having dinner, all shaken up with the event we were just witnessing. The robber did not attempt to come near us after taking the money from the register but instead told us, "walang makikialam" and walked towards his motorcycle as if nothing had happened. Apparently, aside from the manager and the cashier, the rest of the crew ran upstairs and hid there. The two kids who were with their parents were crying and looked traumatized. When one of the delivery crew arrived, he was immediately ordered by the manager to go to the barangay hall, which is about 3 blocks away to report the incident. Two barangay personnel arrived and interviewed the manager what happened. A crew went to see us and apologized profusely and told us that we don't have to pay for our dinner. She even asked the manager if she could talk to the two kids who were already outside and check on them. The store closed at a little before 10 and just delivered the pending orders. I've been held up when I was just a kid but nothing really prepares you when it happens again. I am just thankful that nobody got hurt, especially to any of my family. It still good to know that nobody was hurt but that was a scary experience! indeed it was. i had difficulty in breathing after the hold up. nakakatakot naman..palagi pa naman kmi nasa BF and minsan with our kids pa.
you're really not safe anywhere anymore. you're right, it's a good thing no one got hurt. but the trauma this kind of incident brings, will haunt you for a long time. ive never seen anything like that yet. hopefully never ever. ha ha ha. neither do i. i don't think anybody would get used to it no matter how many times you get involved in such incidents.